Another set of images of the Church is drawn from family. As with other images, only more so here, there are strengths and weaknesses. Most important, they bring to remembrance our families of origin. If our family experiences are, on balance, good, then the images reinforce that, but if the experiences are seriously bad, then the images become stumbling blocks. These can be at least as hard to overcome as the stumbling blocks parents and/or siblings have put before us, especially in our earliest years. If the latter is the case, we need to remember that healing was a major ministry on the part of Jesus and healing familial brokenness continues to be part of that. The Fatherhood of God is an important familial image in Christian spirituality as the Lord’s Prayer reminds us every time we say it. But it is important to remember that God is addressed as “Father” (better yet: Papa) by Jesus before God is addressed that way by us. Jesus is alerting us to the paternal care given all of us by God, but God’s paternity comes to us through Jesus. At the Annunciation, the Heavenly Father, who already has begotten the Son from all Eternity, begets the human child in Mary’s womb. As a conscious human, Jesus experienced the love of his Heavenly Father most strongly when he was baptized in the Jordan by John. The voice from Heaven said: “You are my Son, the Beloved; with you I am well pleased.” This pre-emptive love of the child is fatherhood at its best. It is like the happy parent who is overjoyed with the birth of a child simply because the child is. It is this pre-emptive Love that is the Foundation of the Church, the rock on which the Church is built. The image of Mother, Jesus’ earthly mother, has often been used as an image for the Church. As a particular flesh-and-blood mother she is Mother Church without being an abstraction. That she would nourish the baby Jesus from her own body makes her a perfect image of nurturing. When confronted with the mysteries surrounding Jesus’ birth, she pondered them in her heart. Little else is told us about her from Scripture but she stood by Jesus at the cross, making her the archetype of many more grieving mothers whose sons have been treated the way her son was. The nurturing we receive from our mothers has a lot to do with having a basic sense of security that helps us resist rivalrous mimetic desire as we grow up. Failures in early nurturing create basic insecurities that are difficult to overcome. The Church as a whole is called to delight in every child and to nurture every child during maturation. Important as these paternal and maternal relationships are, they belong to Jesus first and to the rest of us secondarily. That is to say, Jesus relates to us as our brother and we are all Jesus’ brothers and sisters. Considering the history of sibling rivalry in scripture, this is of immense significance. Jesus is the keeper of his brother that Abel never had and he is Cain’s keeper as well. In her book Intimate Domain, Martha Reineke discusses the tension and fundamental choice a child is faced with when a sibling is born: whether to compete or to welcome the sibling as “more of me” rather than less. There is no competing with Jesus over mama or papa so we might as well be civil brothers and sisters with him and with each other in the bargain. 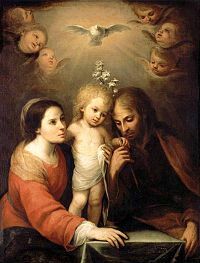 There is a curious story in the Gospels that hint of possible tensions even in the Holy Family. Jesus is told that his mother and brothers and sisters are outside wanting to speak to him. Jesus points to the people who are listening to him and says that they are his mother and brothers and sisters. This indicates that even during his lifetime, Jesus is building a kinship network based not on bloodlines but on obedience to God’s Desire. There are people from broken families who find family through the Church. (Here I mean Church in the broadest sense! Where this nurturing takes place, there is Church, when it doesn’t, there is no church.) Building deep kinship ties through Jesus happens when we allow Jesus to bring us into the arms of his Mother and the Presence of the Heavenly Father who is so well-pleased with us that our hearts melt and we really want to be pleasing to our brothers and sisters. God promised Abraham that he would have as many descendants as the dust of the earth. (Gen. 13:16) I like the later image of the stars in the sky and the grains of sand on the seashore (Gen 22:17) but the earlier image ties in with the creation of humanity out of dust, thus making it clear that descendants of Abraham (like us) are part of God’s ongoing creation. That’s how expansive God’s blessing and being God’s blessing can be. Unfortunately, Abraham does not renounce mimetic desire and rivalry when it comes to his sons Ishmael and Isaac. In spite of being called to be a blessing and promised as many descendants as the dust of the earth, Abraham fails to believe that both of his sons can inherit the blessing he has been given by God. Far from fighting each other, Ishmael and Isaac play well together but they fall victim to the rivalry between their mothers. (Women are equal participants in the mimetic rivalry game in Genesis.) Abraham casts Ishmael out so that his favorite son born of Sarah can inherit the blessing. God, however, makes it clear that there is a blessing for Ishmael, too, even if Abraham did not believe it. Following his father’s example, Isaac assumes that only one of his two sons can receive his blessing and, like Abraham, he wants to give it to his favorite son. Rebekah’s involvement in this rivalry causes this Isaac’s scheme to misfire. This time, it is the son who receives (takes) the blessing who is exiled where Jacob spends many years in rivalry with his kinsman Laban. When Esau re-enters the story on Jacob’s return, we can see that Esau has done well for himself and has no need to envy his brother’s success. Apparently there was a lot more of a blessing left for Esau than Isaac thought. 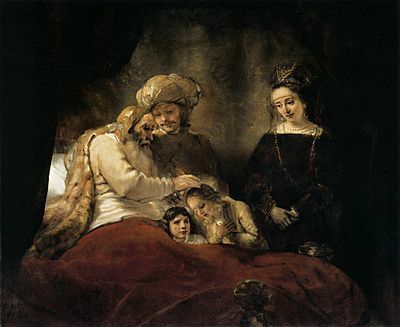 Before he dies, Jacob blesses the two sons of Joseph: Ephraim and Manasseh. He crosses his hands to indicate that Ephraim will be greater than his elder brother, but he gives both boys the same blessing. Finally, through excruciatingly painful experience, Jacob has learned that God has blessings for all of Abraham’s offspring. The yearly cycle of celebrations and commemorations adds solidarity to our experience of time. Christmas, a holiday especially laden with traditions, is a particularly strong anchor, assuring us that everything is as it should be for all eternity. Amen. One of the traditions of Christmas, however, is the giving of charity. That is a very good thing, considering the needs for generosity, and it helps that once a year, people have a custom of dwelling on such matters. But the need for such charitable giving suggests that not everything is as it should be. If huge efforts by charitable organizations have to be made to assure that no child is deprived of a Christmas, then obviously there are serious social problems that need to be addressed. That is, this cozy traditional holiday poses a challenge for the future. 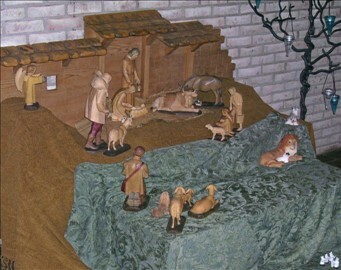 Manger scenes with the new-born Jesus lying in the straw tug the hearts of many and have been a focus of devotion since St. Francis of Assisi introduced the custom in the twelfth century. But the whole point of this nativity story is that Jesus was born in the stable because nobody had room for his mother, father, and himself. This is not business as usual. It raises the question: do we really have room for Jesus in our lives? Do we really have room for all the children being born and for their families? The angel announced to the shepherds proclaimed that this newborn child was the savior, the Lord who was going to usher in a new era of peace. That may sound innocent when we hear this read in church today, but at the time, the Caesar thought he was the savior and he didn’t have room for somebody else to do his job! Of course, he was a savior and keeper of the peace his way, with military and cultural might. The story of the shepherds, then, challenges us to consider who really is our savior and the model of peace for us. Do we keep peace the imperial way though violence to keep everybody in line? We don’t have to have imperial armies to take this approach. All it takes is a drive to control people, by force if necessary. Or do we follow peace Jesus’ way, through vulnerability as a newborn child all the way to the cross and then the Resurrection where Jesus creates peace through forgiveness. A major cog in the engine of Caesar’s peace in Jesus’ neck of the woods was King Herod. Killing all the baby boys in Bethlehem may not look like a peaceful action, but Herod was keeping the peace, imperial style. Most of us may think Herod a bit extreme, but if we are willing to sacrifice anybody who seems to threaten our control of life, especially the young, we are going the way of Herod, the way of Caesar. Jesus, although he had the power to send legions of angels against Herod, remained vulnerable, dependent on human protection until the time came to suffer the fate the boys of Bethlehem suffered. All of this may be a downer for a joyful holiday, but the good news is that Christmas is a yearly wakeup call for renewal of life, a renewal fueled by the divine energy of a human child born over two thousand years ago. Everything that was wrong with the world at the time is wrong with the world now and a lot more. We can keep on going in circles if we want, but we have the chance to step off the not-so-merry-go-round and embrace the Christ Child. We will find that the Christ Child has a gift for us. If we dare to open it up, it is a gift for an open future that we can have if we really want it.